A framework for New Years Resolutions? I wonder how many people are setting themselves some resolutions this year? What is the drive behind the choices they make? Are people attempting to make changes because they are critical of themselves? "I'm too (insert word here)", "I'm not (insert word here) enough", "I should/shouldn't be (insert word here)"? How about a framework for making resolutions? How about basing the choices you make on something fundamentally meaningful? So how might a list of resolutions look using this as a framework? 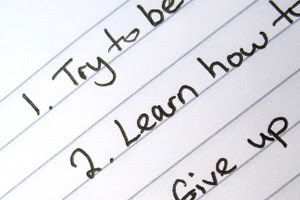 1) Make a list of things you want to do in life and plan roughly when those things can be achieved. Make one of those things happen this year. 2) Find a better work/life balance. Try a session or two with a counsellor or life coach or read a book on the subject. Watch some Alan Watts lectures. Here's a great one. 3) Find a way to be able to express your feelings. Confide in friends. If you struggle to express yourself then try some sessions with a counsellor to learn how to express your feelings. We all have them. We haven't all had the opportunity to learn how to express them. 4) Dig out your old address book and make contact with people you stopped sending Christmas cards to years ago. Or look at those that you send a quick one-liner to and write an actual letter. Arrange to meet up with at least one old friend this year. 5) Allow yourself to experience happiness. If guilt or shame are getting in the way then find a therapist to work through those feelings. Everyone is entitled to feel joy. Find something joyful that you can do this year. Join a group, buy yourself something silly but fun. This doesn't have to be expensive. I got a lot of joy out of buying an old copy of Ladybird Cinderella which I absolutely loved as a kid. It was a few pounds on eBay. I still drool over the three frocks she got to wear in that edition. I do not want to make light of the real struggles that some people face and loss, poverty and ill health as well as discrimination can have a very negative impact on our experience of life. This article is meant to highlight those things that we potentially do have a choice in, although not all of us will be able to make those choices. I remain sensitive to that.